Since All Hallow’s Eve is just around the corner we thought we would complete our Horror and Fantasy series of designs. 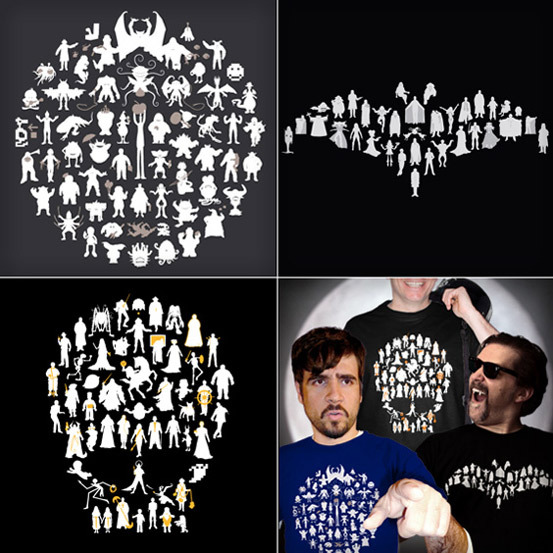 146 icons make up the trio of tshirt designs now available as a discounted set at chopshopstore.com. It is the ultimate trivia challenge for Halloween: 58 different monsters, 35 different vampires and 51 different icons of the undead all referencing generations of film, television, children’s books, video games, music history, toys, literature, cartoons and so on. Totaling out to a staggering 144 icons to figure out and kill an entire day. As a full set they cost only $45 and sell separately for $20. That means you get the third for only $5. Acquire yours for the three days of Halloween… Mischief Night, Halloween Day and the Day of Regret (from eating all that candy).